The Serbian Bogdan Bogdanović (1922–2010) – architect, urbanist, polymath, writer, and former mayor of Belgrade – created some of the most distinctive memorials in Europe. In particular his “Flower of Stone”, the Memorial for the Victims of the Concentration Camp in Jasenovac (Croatia, 1966), and the Dudik Memorial Park for the Victims of Facism in Vukovar (Croatia, 1980; partly destroyed during the Yugoslavian civil wars in the 1990s) gained international attention. 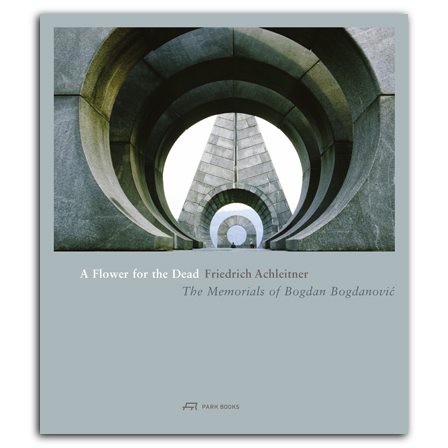 Spread throughout the territories of former Yugoslavia, Bogdanović’s around twenty monuments, memorial sites, and necropolises symbolize both the cultural diversity and the tragic history of the Balkans. Yet they all reflect Bogdanović’s attitude of inclusion rather than exclusion, to unite rather than to separate. Friedrich Achleitner, poet and architectural critic, has been a close friend of Bogdanović during the latter’s years of exile in Vienna. Achleitner has visited all memorials, first together with Bogdanović and, after the artist’s death in 2010, on his own. In this new book Achleitner presents what he has seen during his travels in essays and images. (1930-2019) war Schriftsteller und Architekturkritiker und Professor an der Hochschule für angewandte Kunst in Wien. Er gehörte der Schriftstellervereinigung Wiener Gruppe an und veröffentlichte neben Fachliteratur auch mehrere bellestristische Bücher.